This is R. J. Rummel's fourth book in a series devoted to genocide and government mass murder, or what he calls democide. He presents the primary results, in tables and figures, as well as a historical sketch of the major cases of democide, those in which one million or more people were killed by a regime. In Death by Government, Rummel does not aim to describe democide itself, but to determine its nature and scope in order to test the theory that democracies are inherently nonviolent. Rummel discusses genocide in China, Nazi Germany, Japan, Cambodia, Turkey, Yugoslavia, Poland, the Soviet Union, and Pakistan. He also writes about areas of suspected genocide: North Korea, Mexico, and feudal Russia. His results clearly and decisively show that democracies commit less democide than other regimes. The underlying principle is that the less freedom people have, the greater the violence; the more freedom, the less the violence. Thus, as Rummel says, "The problem is power. The solution is democracy. The course of action is to foster freedom." Death by Government is a compelling look at the horrors that occur in modern societies. It depicts how democide has been very much a part of human history. Among other examples, the book includes the massacre of Europeans during the Thirty Years' War, the relatively unknown genocide of the French Revolution, and the slaughtering of American Indians by colonists in the New World. This riveting account is an essential tool for historians, political scientists, and scholars interested in the study of genocide. "["Death by Government"] should be read in history classes not just across America, but around the world. The problem of power, as Rummel terms it, remains with us today: . . . Only if we learn from the past can we ever hope to end state-sanctioned murder. The case for human liberty and limited government has never been made more effectively than by this fearsome book." --Doug Bandow, Senior Fellow at the Cato Institute. "["Death by Government"] is a compelling study of what the author calls democide--the intentional killing by governments through genocide, politicide, massacre, and terror. . . . A product of eight years of research by a distinguished political scientist, this is an unrivaled magnum opus with dozens of tables, figures, copious notes, and a massive bibliography. Essential reading for historians, political scientists, and readers interested in genocide." "Outstanding Title! [This is] a compelling study of what the author calls democide--the intentional killing by governments through genocide, politicide, massacre, and terror. The book focuses on 14 democides of the 20th century by the governments of the Soviet Union, Communist China, Nazi Germany, Nationalist China, Japan, Cambodia, Turkey, Vietnam, Poland, Pakistan, Communist Yugoslavia, North Korea, Mexico, and Feudal Russia--a total of 169 million murders, which Rummel carefully documents through elaborate statistical techniques... A product of eight years of research by a distinguished political scientist, this is an unrivaled magnum opus with dozens of tables, figures, copious notes, and massive bibliography. Essential reading for historians, political scientists, and readers interested in genocide." * Named an Outstanding Academic Title by Choice! 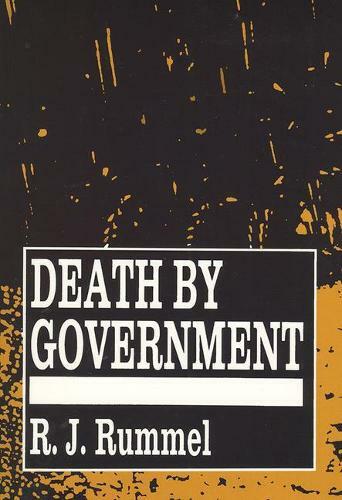 "[Death by Government] is a compelling study of what the author calls democide--the intentional killing by governments through genocide, politicide, massacre, and terror. . . . A product of eight years of research by a distinguished political scientist, this is an unrivaled magnum opus with dozens of tables, figures, copious notes, and a massive bibliography. Essential reading for historians, political scientists, and readers interested in genocide." "Death by Government should be read in history classes not just across America, but around the world. The problem of power, as Rummel terms it, remains with us today. . . . Only if we learn from the past can we ever hope to end state-sanctioned murder. The case for human liberty and limited government has never been made more effectively than by this fearsome book." "Death by Government is a good introduction to the general phenomena of state-sponsored mass murder or democide (Rummel's concept). The numerous case studies are a mizture of carefully wrought description of the horrendous suffering of peoples under maily authoritarian political systems, with just the right dose of personal horror stories to make the book a memorable study of human deprivation and misery. For this effort, Rummel ought to be applauded." "With this volume, Rummel has completed his magnum opus on genocide and government mass murder, in short what Rummel calls 'democide'. . . . Rummel's methodology is based on averaging figures from a large number of sources, rather than historical source criticism or demographic estimates. This is a controversial method, yet it is clearly documented and well argued. . . . This work if a major achievement and will provide a reference point which no future systematic work on democide can ignore." "Governments have murdered about 169 million people in the twentieth century, according to Rummel's estimate. . . . Yet mass murder by governments has been largely ignored by political science. Rummel argues that, to rectify this omission, a reconceptualization of government and politics is required. To this end he proposes the concept of 'democide', which he defines as the intentional killing by a government of unarmed people. . . . Rummerl draws our attention to facts that are often ignored and should not be."